PanARMENIAN.Net - Caspian Defense Studies Institute Khazar has published casualty data on the Azerbaijani Armed Forces for the first 10 months of 2015. 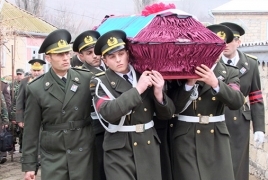 According to the publication, 64 soldiers of the Azerbaijani army, Ministry of National Security,Emergency Ministry and the border troops have died since the beginning of the year: 31 of them are combat losses. 8 out of the remaining 33 have committed suicide, another eight were killed in collateral damage, five were killed in car accidents, 3 soldiers died due to careless handling of weaponry, 2 more were sun-stricken to death, two died because of avalanches, four passed away due to disease, and one soldier died for unknown reasons. Besides, 11 soldiers were wounded in clashes, two others were injured in mine accidents, one soldier was wounded in a suicide attempt, one in a car crash, one was injured in unknown conditions. At the same time, the Armenian portal Razm.info reports that the Azerbaijani Armed Forces have lost 73 soldiers in the course of armed incidents, accidents, collisions on the line of contact and other incidents since the beginning of the year.